HAWSON Freemason Cufflinks and Tuxedo Shirt Studs Set - Men' Wedding Accessories | What Should I Say? HAWSON Custom Black Enamel Man Tuxedo Shirt Studs and Cufflinks Set for Wedding Business Jewelry Silver . 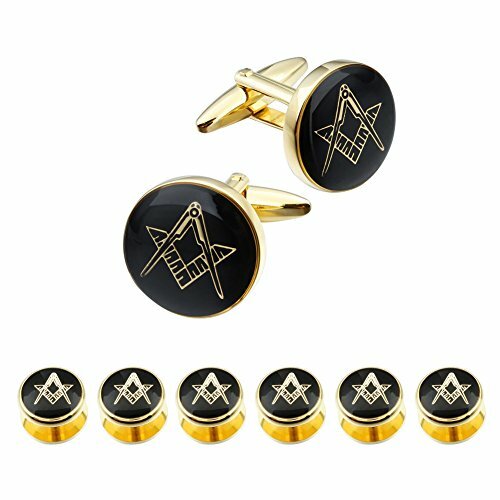 Gold Plated Base Copper Black Enamel Free-Mason Man Shirt 6 Studs and 2 Cufflinks Set. Cuff Links:17mm,Studs:12mm,Weight: 34.2g, Packing with A Gift Velvet Bag . JJ Weston Cuban Cigar Tuxedo Cufflinks and Shirt Studs. Made in the USA.